Visit the Bush Presidential Library during your stay! The Loft is a delightful, beautifully decorated B&B featuring antique furnishings and fascinating historic photographs throughout. The newly renovated guest house, accentuated with extensive landscaping updates, is within walking distance to Texas A&M University and Kyle Field. 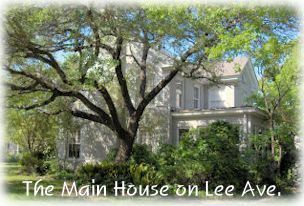 This location offers a welcomed retreat for football fans, A&M parents, alumni and visitors to the Bryan - College Station areas of Texas. The photo (right) is taken from the rear garden of the main house. The view shows the recently added upper deck and the staircase to the main entrance of The Loft, as well as part of the well-kept garden, and befitting white picket fence. Enjoy a full kitchen, private bath, dining area, cable television and wireless Internet access. A sleeper sofa is available for an additional guest. The large balcony is a great place to relax and entertain. A continental breakfast is provided daily for guests to enjoy at their leisure. There is much to see and do in your off-time during your stay. Explore the historic points of interest in the area. You will find a Visit antique shops in downtown Bryan, taste Texas wines at the Messina Hof Winery, and discover fine dining in College Station. 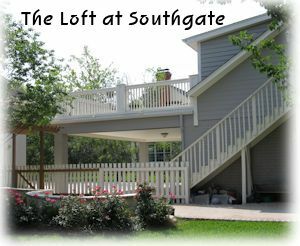 The Loft at Southgate Bed & Breakfast is clearly an appealing alternative to stays at hotels, motels, motor inns and extended stay properties in College Station. The main house pictured (left) was built in the 1930's by a Texas A&M professor. The original guest house has been completely renovated and reincarnated as the Loft at Southgate Bed and Breakfast. The fine antique furniture is hand selected and restored to create a pleasing ambience of yesteryear. The property owners are enthusiasts of the rich history of Bryan - College Station and nearby Texas A&M University. Many interesting historic photos of the area have been framed to adorn the walls of The Loft. A collection of old newspaper articles have been selected and are bound in a book for guests to peruse and enjoy. Articles are provided by the Cushing Memorial Library and Archives at Texas A&M. 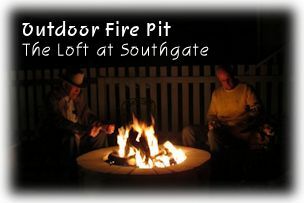 For a unique lodging experience call now to reserve The Loft at Southgate Bed and Breakfast! Nightly and extended stay rates are available. Click here for reservations and details. You will appreciate and enjoy the many new updates to the interior and exterior of the property. New landscaping additions include a fire pit (pictured right), masonry walkway and gardening updates. Follow the blue buttons above, to view more indoor and outdoor photographs. Call for reservations when planning your next visit to College Station and Texas A & M University. Be prepared to enjoy Texas hospitality in a big way. Planning a vacation getaway or ski trip? Why not think about scenic New Mexico? To take a look at our two offerings in Red River, NM follow the links below.